The survivor of a vicious assault that left him with a traumatic brain injury escapes into a fantasy world where he is a WWII hero surrounded by a support group of the women in his life. Sometimes, even with an imaginative concept, the right subject, and good casting, things can still go disastrously wrong. "Welcome to Marwen" is directed by Robert Zemeckis, who is known for making iconic films like the "Back to the Future" trilogy, "Who Framed Roger Rabbit?" and "Forrest Gump." He also helped write the film along with Caroline Thompson, who was a writer on films like "Edward Scissorhands," "Homeward Bound: The Incredible Journey," and "The Nightmare Before Christmas." The movie is based on the true story of artist Mark Hogancamp (Steve Carell), who was the survivor of a severe beating that left him with a traumatic brain injury and virtually no memory of his life before the attack. He copes with his condition by escaping into the fantasy world of Marwen, a fictional town in WWII German-occupied Belgium. 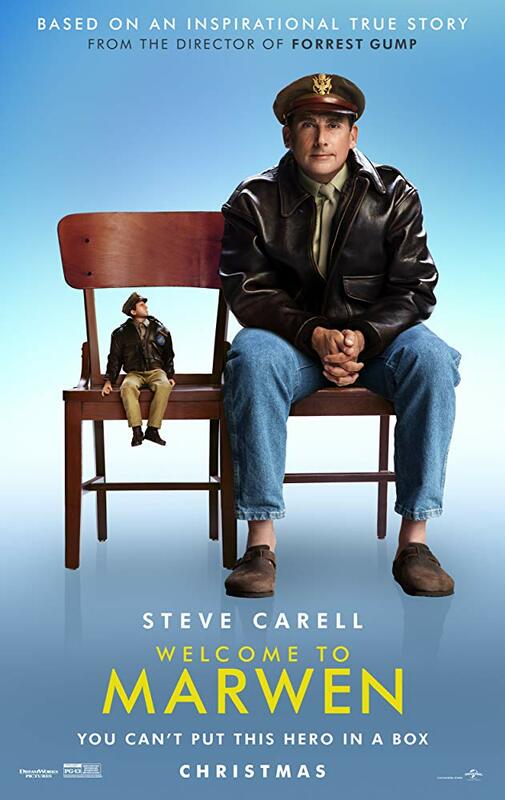 In Marwen, Cap'n Hogie, his alter ego in doll form, is the hero of his fantasy world. He is surrounded by beautiful women, who represent the real ladies in his life who help Hogie fight off the Nazis who have him under constant attack. These women must help Mark find the courage to testify at the sentencing of his assailants to ensure they get the maximum penalty and pay for their crimes. We were pretty excited about "Welcome to Marwen" when it was first announced. We absolutely love Steve Carell. We have enjoyed many of Robert Zemeckis's films, and we thought it was a creative choice to use dolls as a metaphor for Mark's traumatic brain injury and PTSD. Unfortunately, the metaphor Zemeckis is trying to convey winds up being far too ham-fisted to be impactful or successful. He also fudges facts to make the metaphor more literal as he takes Mark's assailants, who were actually a bunch of teenagers, and turns them into literal neo-Nazis. The vast majority of the movie takes place in Mark's fantasy world, and the real-world counterparts of the women represented in his town each get maybe one scene in the real world if they are lucky. The exception to this is Roberta (Merritt Wever), who works at the hobby store where Mark gets his dolls for Marwen, and Nicol (Leslie Mann), who just moved in across the street from Mark. Speaking of Roberta and Nicol, much of the movie winds up being focused on an awkward sort-of-but-not-really romance that has its protagonist coming off as a bit of a creeper who doesn't seem able to discern the difference between the fantasy he has created in his own head, and the actual situation playing out in reality. This causes Mark to act out in many uncomfortable ways. It's as if the filmmakers thought they needed to add a romantic subplot into Hogancamp's story to tug on the heartstrings of the viewers and get us into his corner (as if we weren't already...he was senselessly beaten almost to death), but it wound up being a disservice in the long run as it negatively impacted our perception of him as a whole. All of this is massively unfortunately because we do like the cast. We wish we could say the acting is at least good, but truth be told, many of the scenes feel forced and unnatural. At least Steve Carell doesn't act like he's looking down on the material. Also, if you thought Jennifer Lawrence had a bad Russian accent in "Red Sparrow," or if you thought the worst accent you ever heard was Kate Winslet's cartoonish depiction in "Triple 9," then Gwendolyn Christie's Russian caricature that goes full-on Natasha from "Rocky and Bullwinkle" makes the other two look magnificent by comparison. We hate saying this, it physically pains us to do so because we love her so much, but her accent is so, so goofy and out of place. This and all of the other issues combine to make serious subject matters like TBIs, addiction, and hate crimes seem like catalysts for more and more Brick Tamblin-esque shenanigans. The one thing we can say we genuinely enjoyed about "Welcome to Marwen" is its visuals. Zemeckis is a master of innovative effects, and "Marwen" is no different. The film is technically well shot, the costumes are nice, and the visual effects are masterful. In fact, its ambitious visual aesthetic should be applauded, and we absolutely agree with it being on the shortlist for best visual effects at the Oscars this year. Still, these scant few positives don't make up for its sloppy writing and its ham-fisted storytelling. We aren't sticklers about biopics being 100% truthful, but we assert that they should at least fully capture the spirit of its subject, and we can't say "Welcome to Marwen" does that.